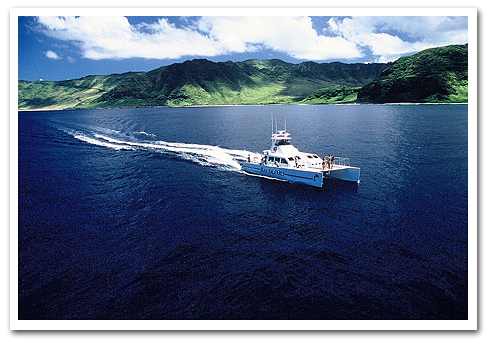 Hop aboard the Kai ‘Oli’Oli Oahu’s only marine vessel designed exclusively for the best ocean activity experience. 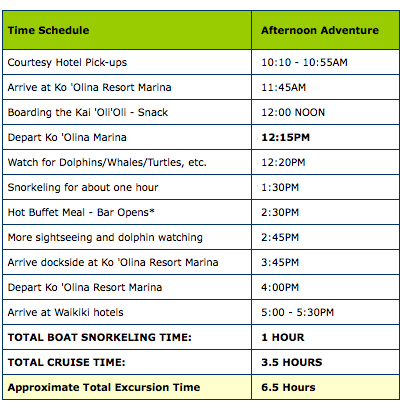 A cruise isn’t just about where youre going snorkeling or how many dolphins you see. It’s also about the boat you’re on, and it doesn’t get any better than being on the Kai ‘Oli’Oli  one of the best tour vessels in operation today. With state-of-the-art equipment, youll most likely find yourself snorkeling with the most colorful marine life you’ll ever see. Our cruise adventure is the only experience that will take you up the entire Waianae coast (west coast of Oahu), from Ko ‘Olina Marina to the northernmost tip of the coast, the sacred Ka’ena Point. After an exciting ride up the coast, we’ll enjoy an hour of snorkeling just off the Kaena Cliffs, past the end of the road, where the only access is by boat or hiking. We provide the best of snorkeling equipment for you to enjoy as you swim in the sparkling blue water of Makua amongst unspoiled reef and sea life where no other tours take you. The only tour that takes you along the entire West Coast of O’ahu! Goes about 40 to 50 miles round trip, and emphasizes going all the way to beautiful Makua Valley, Yokohama Beach and even Ka’ena Point. Lunch of macaroni salad, rice, pineapple, Kalua Pork and Hawaiian-style teriyaki chicken, with buns, lettuce and tomato to make sandwiches if desired. 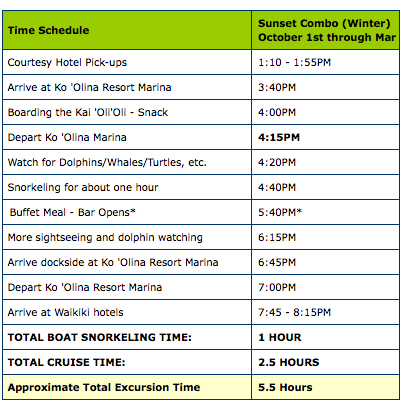 One hour shorter and typically travels 20 to 30 miles, so there is a bit less time for sightseeing and dolphin/whale watching. Brunch of chopped fruit, yogurt, muffins, rice and Kalua pig, with buns, lettuce and tomato to make sandwiches if desired. Alcoholic beverages are available by request at $3.00 per drink. Goes about 40 to 50 miles round trip, and emphasizes going all the way to beautiful Makua Valley, Yokohama Beach and even Ka’ena Point during sunset time. ALL CRUISES include one hour on a snorkel site of the captain’s choosing (according to conditions of the day), with the same professional quality gear and instruction from the friendly crew. April 1 through September 30: The Sunset Deluxe Combo Cruise will run between 4:00PM – 7:30PM, and will have the Deluxe Mid-day Cruise Price. October 1 through March 31: The Sunset Deluxe Combo Cruise will run between 4:00PM – 6:6:30PM, and will have the Morning Calm Cruise price. Spoil yourself! Enjoy the intimacy of having the Kai OliOli all to yourself, your friends, and family — up to 49 passengers. Book a private charter for an “outer island experience” of sightseeing on pristine coasts, watching the playful dolphins, majestic whales (December through April), and snorkeling among giant green sea turtles and tropical fish. Sunset cruises, weddings, birthdays, memorials, business occasions… your imagination is the limit! 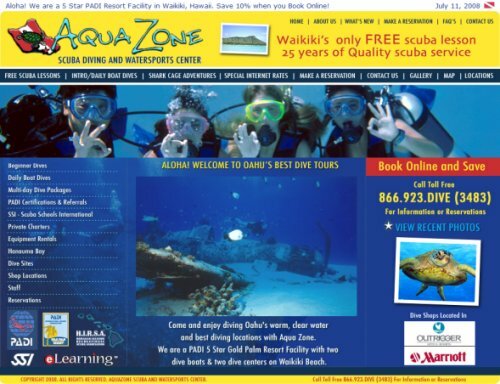 Come and enjoy diving Oahu’s warm, clear water and best diving locations with Aqua Zone. We are a PADI 5 Star Gold Palm Resort Facility with two dive boats & two dive centers on Waikiki Beach. Your Comfort & Safety is our primary goal. 1. We offer a FREE Pool “Warm up” prior to ocean dive. Call Toll Free 1-866-923-DIVE (3483) for information or to make a reservation. 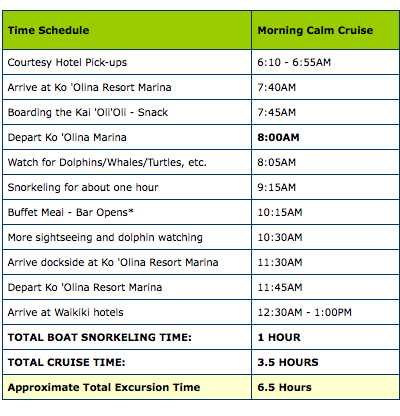 We will try our best to accomodate the time schedule you want for your diving excursion. We will contact you with a confirmation by email or by phone of your reservation. Visit our Special Internet Rates page for more information on our dive excursions, prices. Book Online and Save Time and Money! What’s the weather like in Hawaii? Do we need to rent a car? What should I pack? Where can I rent a surfboard? What’s a Spam Musubi? Where’s the best place to hangout at night? What do we need to do to get married in Hawaii? What’s new in Waikiki? Where are the best places to eat, shop and play? 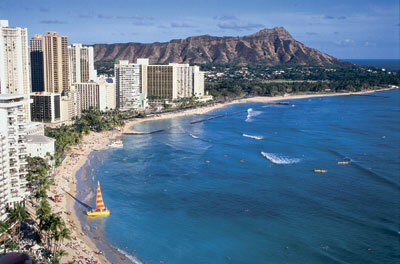 We’ll answer these questions and much much more in our insiders Guide to Waikiki & Hawaii. Other features of our insiders GUIDE? 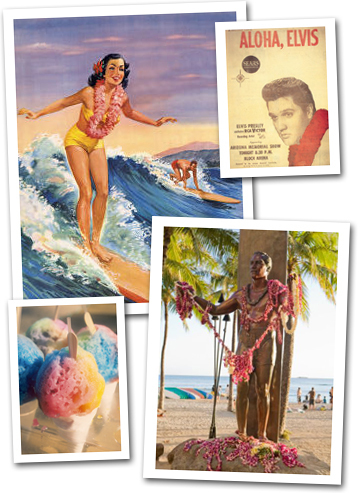 From Kamehameha the Great to Elvis Presley, find out the rich history of Waikiki from swampy farmlands to royal playground and how it became one of the most famous destinations in the world. Waikiki is in the midst of an amazing revitalization. From the renovations of the two historic hotels – The Moana and The Royal Hawaiian Hotel to nightly torch lighting & hula shows. Learn about how Waikiki is coming alive with the history, culture and the beauty of Hawaii making it a very exciting place to visit. There is also the new show Waikiki Nei that will debut July 2008 at the Royal Hawaiian Center. Waikiki is one of the most popular wedding destinations in the world. You can have your dream wedding on the beach with friends and family and your romantic honeymoon all in beautiful Hawaii. Find out what you need to get started on your dream wedding in paradise! The pinepple and sugar planation era brought many cultures together to make Hawaii’s cuisine one of the most exciting and diverse on the planet. Don’t miss the local flavor that is as much of Hawaiian culture as the hula. From a mixed plate lunch with mac salad and two scoops of rice, a yummy SPAM musubi, to shave ice – you will find many more reasons to fall in love with Hawaii. Tony Romas Celebration 35 yrs of serving up some of the BEST RIBS on the planet! We are now featuring Tony Roma’s in our EAT section of Waikiki.com with their discount coupons. Menus have expanded and changed with the times, but you can still get the same personal, friendly service that made Tony Roma’s Place the hot hangout in North Miami, Florida back in 1972. Visit the Waikiki restaurant for their Baby Back and St. Louis Ribs; juicy steaks; signature seafood; tender, grilled chicken; crispy fresh salads; burgers; made-from-scratch Onion Loafs; desserts; drinks and more. Check out coupons for discounts on Salads and the famous Onion loaf! Welcome to Visit Waikiki. We’ve started this blog to show off our website Waikiki.com and hopefully provide all the info a visitor would need when coming to Waikiki for a visit. We will be trying to add all the basic info that we can think to make your visit a great one.